There are few things I enjoy as much as seeing a good new play and then talking about it the entire commute home. And I don’t mean just talking about what we liked or didn’t like, or the design, or even the acting. I mean, talking about the play – diving deeper into the ideas it touched on. I love when the conversation continues after the lights come back up. The playwright Bruce Norris wowed me (plus a few Tony voters) with Clybourne Park a couple seasons ago, so when I heard he had a new play at the Mitzi E. Newhouse up at Lincoln Center, I bee-lined for Linctix to buy myself a ticket. 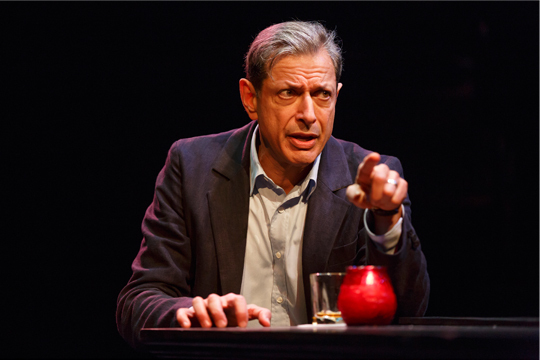 Not to mention it’s directed by Anna D. Shapiro (August: Osage County) and starring Jeff Goldblum and Laurie Metcalf. It’s called Domesticated, and I do recommend checking it out. Now I don’t want to give much away because I think the play raises some very interesting questions, and they’ll sound a whole lot smarter in the context of the play than me trying to paraphrase them here. I will say that it is a piece about gender, politics, (gender politics? ), betrayal, morality, and the concept of men versus women, in all respects really. A politician, Bill (Goldblum), is introduced. He is at a press conference confessing to a crime, resigning from his post, and his wife Judy (Metcalf) is at his side. The Good Wife, anyone? Bill is surrounded by women in his life. After that first speech of his, he is primarily silent for the remainder of the first act. It’s fantastic to watch. He is talked over and practically trampled by these women (his wife, his daughter, his lawyer, etc.). But boy does he start to talk in Act 2. What’s incredibly impressive about the “men versus women” conversation that Norris brings up is that in one moment I found myself fully on Judy’s side, but at the same time, I was eagerly awaiting Bill’s rebuttal. This (male) playwright manages to represent both sides/genders quite effectively. Bill can be incredibly misogynistic and sexist at times, but then in the next moment, I actually find myself sympathizing with his character. But then he opens his mouth again. It helps that Goldblum’s trademark way of speaking keeps things lighter and more casual than they might typically be. As the plot unfolds and we watch Bill’s fall from power, there are some nice surprises along the way, great laughs, smooth set changes, clever plays on media and marriage, and a really strong ensemble to tell the story. Overall, I would say that if you enjoy going to the theatre to think, I highly recommend Domesticated. And after that? I would love to hear your thoughts.